I can’t believe it. Alexander Rossi in Wilsonville. I am there. The doors are to open at 6:00. I was there at 5:30. 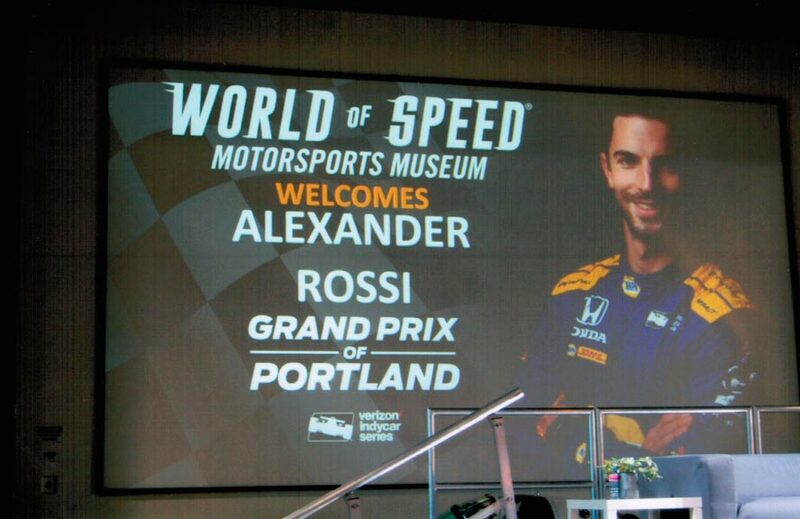 I expected a mass of people, after all, it is Indy 500 winner Alexander Rossi! There was only one other person there. At 6:00, the doors opened and by then, there were a lot more people. I bought my ticket and entered paradise. 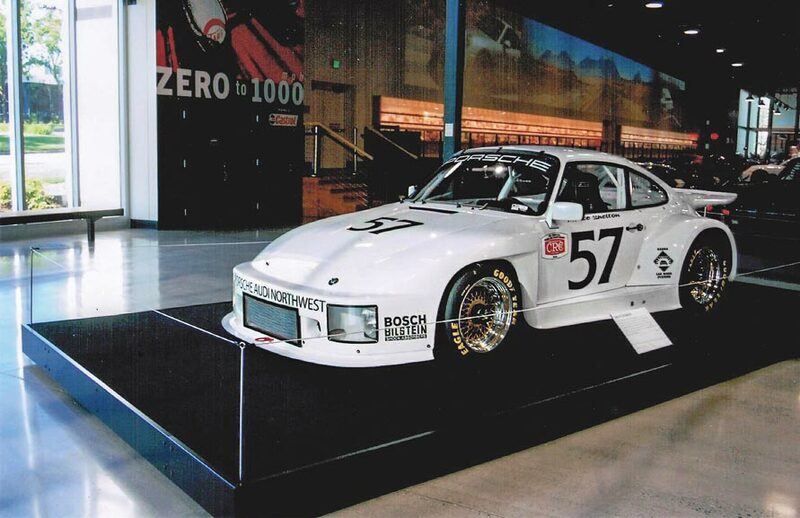 The marque display was Porsche 911 cars. The Porsche 911 is a beautiful car. In race form, with wide wheels and tires, with it’s aerodynamic body work and flared fenders and wings it’s gorgeous. The 57 racer that was driven by Portland’s, Monte Shelton was there. I met Ron Huehli, the curator of the museum. In 2017, Ron drove the number 26, a 1966 Lola at the vintage race at the speedway. The Lola was originally raced by Roger Ward, who came in 18th in the 500, in 1966. Mr. Huegli was kind enough to show me around the facilities. We went through the area designated for restoration, the shop area where auto repair classes are held and storage for cars not on display. In that area was stored Rolla Vollstedt’s first Indy car he built. The Offy powered car rain in the 1965 Indy 500. It was driven by a northwest driver, Billy Foster of Canada. Enter Alexander Rossi. He said that he was glad to be there. He would be starting in 32nd positions in this years 500, not 3rd like last year. Would be challenge. He seemed positive that he could work his way up through the field. What is the difference between Formula 1 and Indy cars? Do you prefer to hand out with Formula 1 drivers or Indy car drivers? Have you seen the PIR track yet? 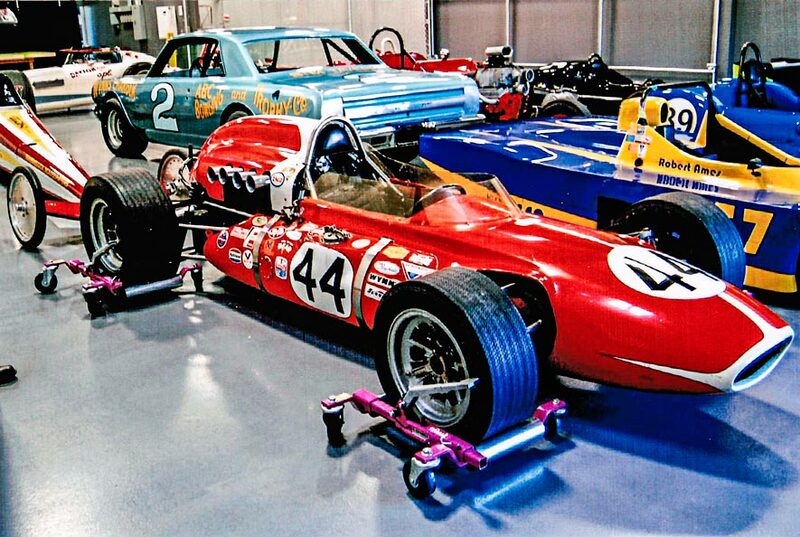 What is the difference your own car and an Indy car? What other forms of motorsports would you like to drive? Having raced Formula 1, today, would you rather race at the Grand Prix of Monaco or the Indy 500? What was the first car you drove when you got your driver’s license? After winning the 2016 500, coasting across the start-finish line, coming to a stop, you sat in the car for a long time? There were other questions but, I thought these were an example of some of the good questions. Now, off to the “meet and greet.” There are over 200 people there. Among them was Tony Wilson, Founder of Wilson’s NAPA, with about 20 stores throughout the Wilsonville Valley and the Columbia Gorge. Also, my former boss for 18 years. After I got Alexander’s autograph, I asked him a question about what happened on the second qualifying attempt? On Sunday I watched the greatest spectacle in racing, watching Alexander move up through the field. Driving smoothly, he was passing cars on the outside, dodging wrecks, and working his way into the top 10. At one time he was leading the race, then he finished in fourth. Great job of driving especially since he started 32nd. I’m looking forward to watching him race at Portland International Raceway in the September Grand Prix of Portland.